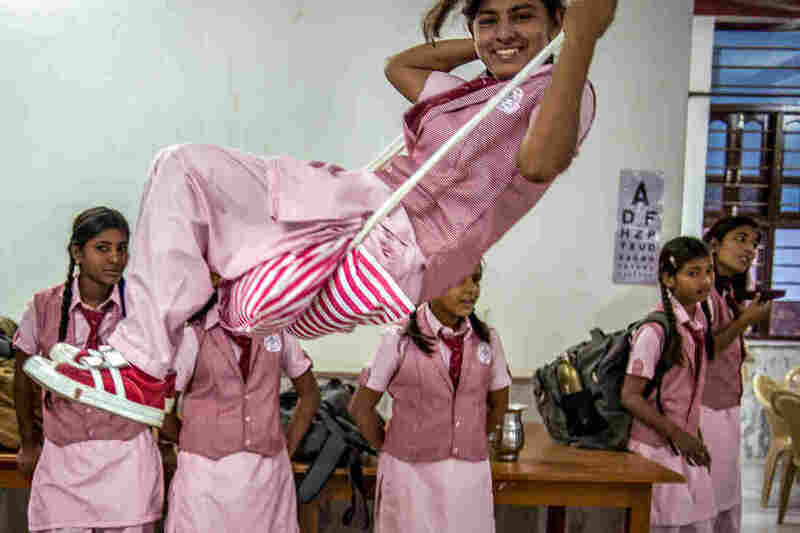 Why This Child Bride Needs Good Grades: #15Girls : Goats and Soda Nimmu attends the Veerni boarding school in Jodhpur, India. The grade she gets on a national exam this year will decide her future. Nimmu, 15, on the terrace of the Veerni Institute. To stay in school, she needs to pass a national test this March. The problem: "I'm not a great student," she says. Because child marriage is illegal in India, we can't use her full name. Nimmu is 15 years old. She comes from a rural village in northern India, and she's been married since she was 10. This year she's trying to change her fate. 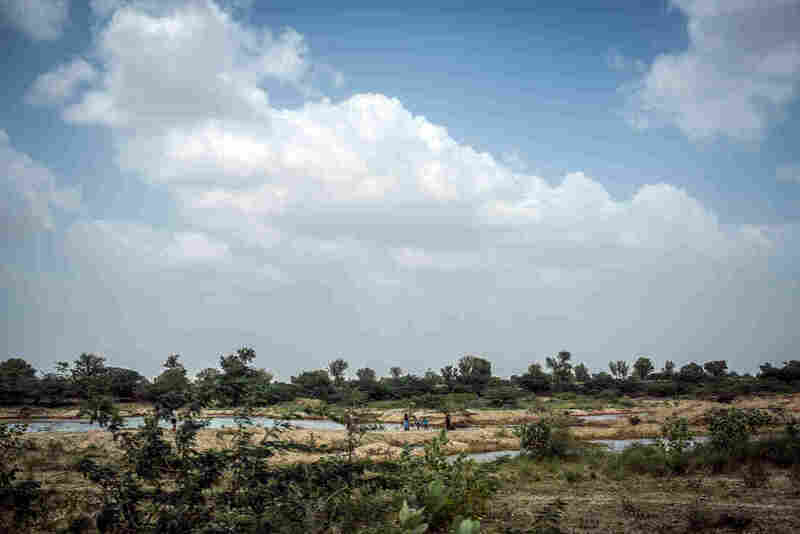 In Nimmu's village, when you're married young, you don't move in with your husband right away. You stay with your own parents until around your 15th birthday. That's when they send you to your in-laws. From what Nimmu has seen, you basically lose your freedom at that point. The in-laws assign whatever chores they see fit. And you're expected to follow their orders without question or complaint. Girls start the day with a prayer at the Veerni Institute in Jodhpur, India. 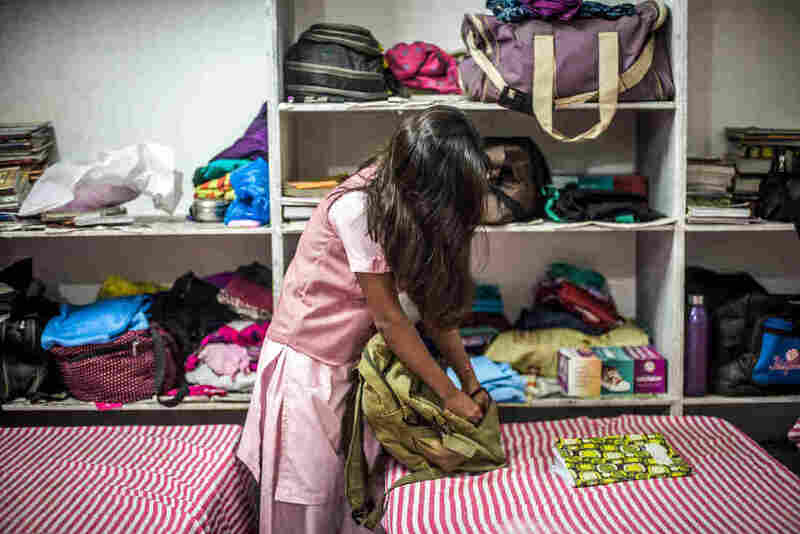 It's a boarding school where nearly half the students are child brides. Right now only one thing is keeping Nimmu from that life: She's at a boarding school in the city of Jodhpur. It's run by a charity called the Veerni Institute. 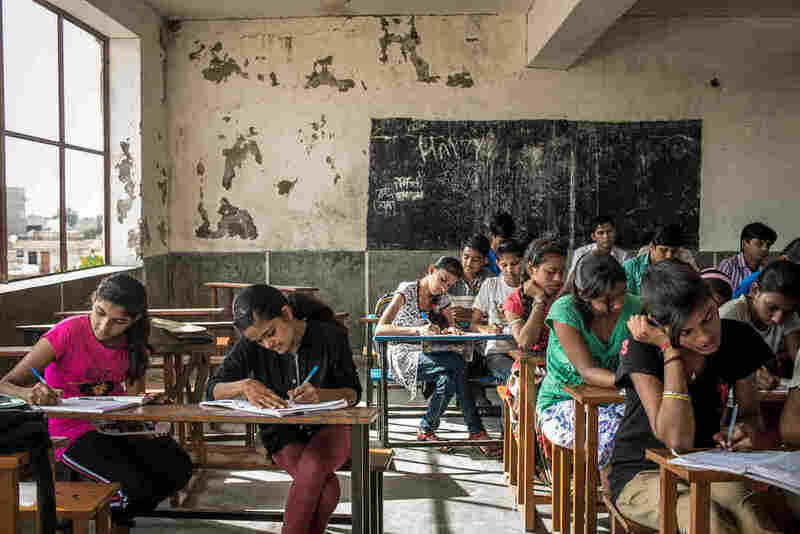 Nimmu's in-laws have been urging her father to hand her over, but her father has agreed to hold off the in-laws and let her stay at the school as long as she gets good grades. It's a lot of pressure. "Before, school wasn't such a big deal to me," Nimmu says, speaking in Hindi through an interpreter. "But this year I suddenly feel so much pressure, and I've become extremely serious. I want to do very well." To continue beyond 10th grade she'll need to pass a tough national exam this March. "And as of now, I'm not a great student," she says. Child marriage has been illegal in India for years. (That's why we can't use Nimmu's full name; it's also illegal to name a minor involved in a crime in India.) Nevertheless, the practice is deeply embedded in the culture of many rural areas, and parents marry off their children all the time in secret. Nearly half of women age 20 to 24 in India were married by the time they turned 18 — with nearly one in five married by age 15, according to UNICEF. And India accounts for about a third of the world's child marriages. We get a sense of what Nimmu is up against when we catch up with her midway through a long day at school. It's 3 p.m. Nimmu has been in class almost continuously since 7 a.m. Now it's time for study hall. An aide pops his head in the door and barks at everyone to keep quiet. But Nimmu is worried about her math homework. She twiddles with her long braid, then pokes a friend. "Hey!" she whispers. "Can you check this? My answer doesn't match what's in the book." 3:30 p.m. Nimmu has moved on to English class. Seventy kids are crammed onto metal benches. It's stifling hot. Nimmu is losing focus. She starts humming to herself. Next up, chemistry. Nimmu sighs heavily. The teacher starts droning — and Nimmu is immediately lost. "Sir ... we can't understand anything you're saying," she mutters under her breath, half-laughing, half-moaning. "It's like you have marbles in your mouth." It's not until 8 p.m. that Nimmu finally gets a chance to chill in her dorm. The room is spare — no decoration on the walls, no chairs. Just four metal cots lined up in a row. Nimmu sits on one of them. Her roommates squeeze in next to her. "Do you whisper to each other at night?" we ask. "Yes ma'am," they say. "What are you going to talk about tonight when we leave?" we ask. Nimmu breaks into a mischievous grin. "Ma'am, you!" she says. The girls are among 70 students provided with free room, board and schooling by the Veerni Institute. They're all from remote villages that generally don't have a high school nearby. About 30 of the girls are married — including every one of Nimmu's roommates. One of them, a shy girl in a colorful headband, tells us she was 9 on her wedding day. Nobody explained what was happening during the ceremony. "I had no idea I was getting married," she says. Nimmu did know. She was matched with a boy just a few years older. "I was married at 4 a.m. because that was considered an auspicious hour. ... I woke up and I wanted to go back to sleep, but my family wouldn't let me." They helped her into a traditional Indian wedding gown. "My dress was red," she remembers. "And it was very big because I was very small. And the scarf on my head was also too long." We ask her if the gown was pretty. "No," she says, switching from Hindi to English and giving a rueful chuckle. "I don't like this." It was too old-fashioned, she explains. And the embroidery was lame. Still, at the time, Nimmu was excited. It was a party. Then she noticed that her older sister was sobbing. She was also being married that day. "I asked her, 'Why are you so upset? You're getting married,' " Nimmu recalls. "She said, 'You're too young to understand. You'll understand when you're older.' "
Today, Nimmu does understand. Because she sees what's happening to other 15-year-old girls in the village. This summer one of her closest friends was sent to her in-laws. Now that girl spends all day cooking and cleaning for them. "She tells me there is no life after marriage," says Nimmu. "She has no freedom. She has to do everything her in-laws say." Nimmu's in-laws seem to have a similar future in mind for her. "My in-laws don't want me to study 10th grade. They're OK with it as long as I'm doing well. ... Otherwise, they say what's the point?" Nimmu's not trying to get out of her marriage. Arranged marriage is the norm in much of India. But she does want to delay the start of her married life. She wants to wait until she has enough education to land a job. She's heard that with a high school degree, or better yet, two or three years of training beyond, even a village girl can get a job as a teacher or a community health worker or a policewoman. Nimmu is vague about what job she could do — maybe something in an office? But she has at least seen the example of a great-aunt who has a job as a teacher and who seems to be treated with so much more respect in her family. To Americans, it might seem a minor difference to start an arranged marriage at 18 or 20 rather than at 15. But Nimmu thinks the impact will be huge on her quality of life. It's one thing to arrive at your in-laws' house as a 15-year-old school dropout whom everyone can boss around. Quite another to arrive as a woman with her own income. "That way nobody will be able to get away with saying to me, 'You're good for nothing.' ... And even if they say it, I can tell them, 'I earn my own money. I eat off my own money. So what's your problem?' "
It's Sunday. Nimmu's one day off. We're in the car with her driving home to her village. She doesn't visit often. The director of the Veerni Institute is taking her today because she needs to pick up last year's report card so she can complete her registration for this term. We bump along a sandy, narrow road — flat desert stretching for miles on either side — before stopping next to a collection of concrete block huts. Nimmu springs out of the car. "Papa!" she cries at the sight of her father. "Welcome, welcome, welcome!" he says. She heads into her house. It's dark and cool inside. She pulls out a metal chest by her bed and starts searching for the report card. Her father watches, a little worried. His name is Lumbaram. Like a lot of rural Indians he goes by one name. He dresses like a typical villager — white tunic, multicolored turban. He's got a typical job among the men here as a construction worker. And he says all his life he's been taught the typical view of girls in the village: They're a burden. One more mouth to feed until you raise a dowry to pay some other family to take her off your hands. He never accepted that idea. "No that's a terrible way of thinking," he says. "Even as a child I always believed a girl and boy are the same." He can't explain why he's always felt so differently from everyone else he knows. Maybe because he never had sisters and wished for them, he muses. Yet when it came to marrying off his daughters, the family pressure was impossible to resist. It all started because Lumbaram's younger brother needed a wife. "There is a shortage of girls everywhere. We couldn't find a girl," he says. It's a persistent problem in this region. Having a girl is considered such a curse that families often insist on aborting a pregnancy if they find out the fetus is female. Or they'll kill an infant girl right after she's born. 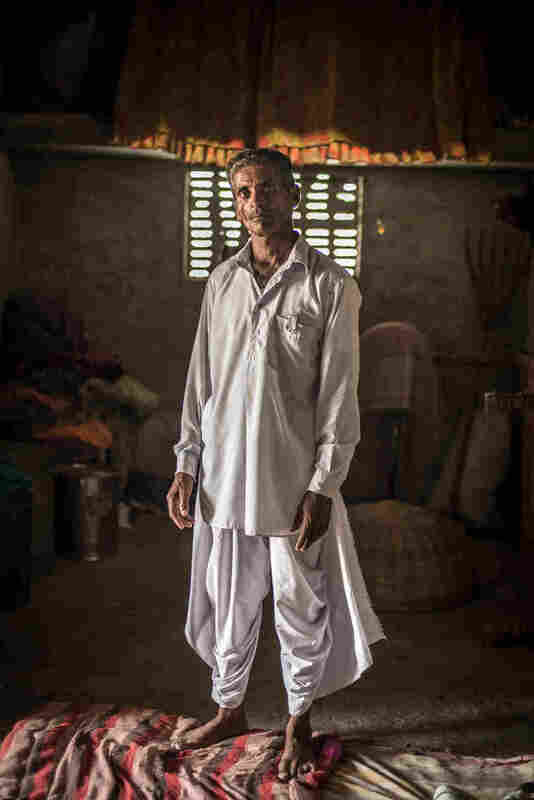 "I searched for a bride for my brother for eight years," says Lumbaram. Finally he had to make a deal with another family: Their daughter would marry his brother, and he'd give them his eldest daughter to marry their son. It's a common trade. And here's where Nimmu comes in. She's the middle daughter. And in the village, when you arrange a marriage for one daughter, you often marry off the rest at the same time. 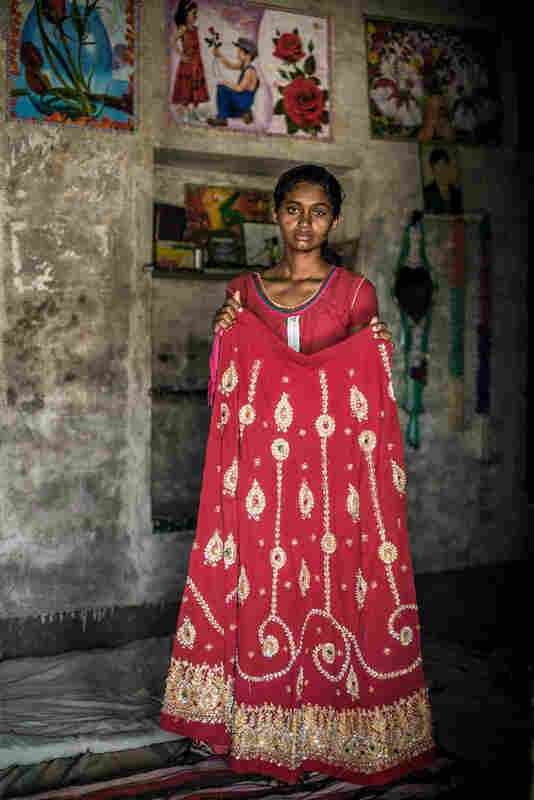 "We are very poor and it takes so much money for one girl's wedding," says Lumbaram. "If I get one girl married it's the same price as if I get several girls married." Still, he hated doing it. Just talking about it he starts to choke up. "I really cried a lot at the time," he says, after regaining his composure. "Even right now I feel like crying. It hurts to see my child going through so much trauma. It makes me so sad." But Lumbaram has vowed to make it up to his daughters. And the Veerni Institute has given him a way to do that by paying for their education. Normally Lumbaram couldn't afford to send Nimmu to high school. She would be sitting at home, and he'd have no excuse for not sending her to her in-laws at 15. Now he can tell them, "Look, she's finishing high school." Nimmu is grateful to her father for sticking up for her. Still, the arrangement can sometimes strain their relationship. When she does poorly on a test, she says, "He gets angry with me and tells me ... we're going to have to withdraw you from school and send you to your in-laws' house because what will I have to tell them. ... He's under so much pressure in the village." That's why at this particular moment, Nimmu is starting to stress out. It turns out the report card is nowhere to be found, and the deadline for handing it in is tomorrow. "Maybe it's in my trunk back at school?" says Nimmu. "But I lost the key to it." Her father shakes his head. Nimmu's having a typical scatterbrained teen moment. But in her situation, every slip-up feels fraught with consequences. Nimmu borrows a cellphone to call an administrator back at the school. Can you try breaking the lock, she asks. A few minutes later the administrator calls back. The report card was in the trunk. Crisis averted, Nimmu starts walking back to the car with the Veerni Institute's director. Lumbaram stops them. He points to a girl, lingering a few feet away. Can you please enroll her in the school, too, he asks. "She's really intelligent," he says. "It's just that her parents don't care to educate her." The director, Mahendra Sharma, looks pained. His budget is stretched to the max. "I guarantee," Lumbaram continues. "This child won't cry and be homesick. She will just study." OK, the director, agrees — he'll see what he can do. On the long drive back to school, we talk music. Nimmu breaks into one of her favorite Bollywood songs. It's called "Hangover." "I tried forgetting you!" Nimmu sings in Hindi. "The hangover of your memory!" Suddenly, it's possible to forget that Nimmu is someone's wife. For these few minutes, at least, she's just a 15-year-old girl, in the back seat of a car, singing a pop song.